You know how in horror movies you can sometimes summon the monster by simply saying his name? That’s how it happened for me. 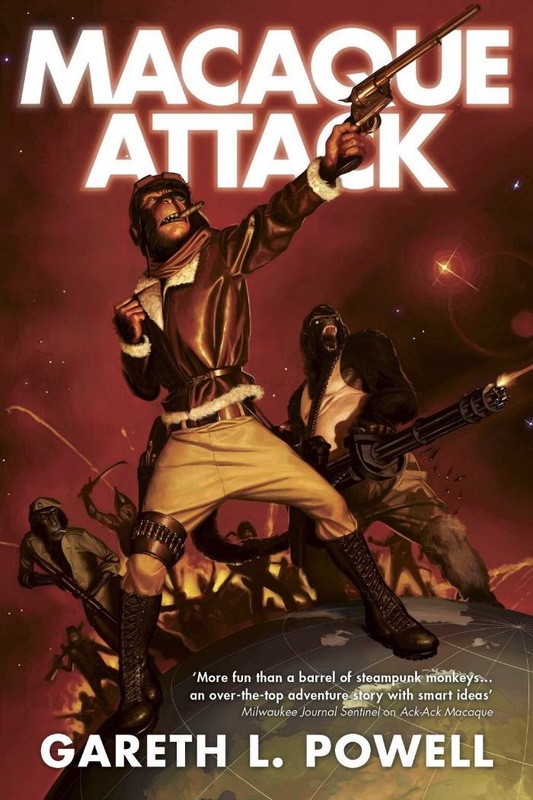 When Solaris Books published my fifth novel Macaque Attack in January 2015, it marked the end of a bizarre and unexpected journey—a journey that began some time in 2006, when the words ‘Ack-Ack’ and ‘Macaque’ started rattling around in my head, and I scribbled them into my notebook. 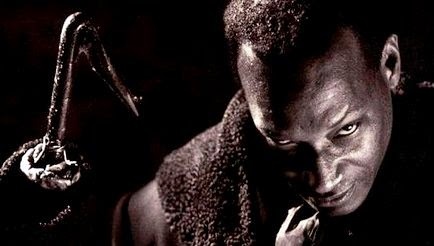 I didn’t look in a mirror and say ‘Candyman’ three times; I simply wrote down two words. ‘Ack-ack’ is wartime British slang for antiaircraft fire, and a ‘macaque’ is a type of monkey. It sounded like a name. There was something about the rhythm of the syllables. I wrote it down and said it aloud and, hey presto, there he was. He sauntered into my brain fully formed: a bad-tempered, cigar-chewing monkey pilot with an eye-patch and a pair of shiny Colts. He was part Lee Marvin, part Biggles, and part John Belushi in 1941—a cynical badass stick-jockey with an eye patch and a cigar. At the time, I needed a fictional anime character for a short story I wanted to write. I wanted to say something about the commodification of culture, especially in movie adaptations of books and comics, and so I needed a cartoon character with rough edges. I put Ack-Ack into the story and he took it over. I even ended up naming the story after him. 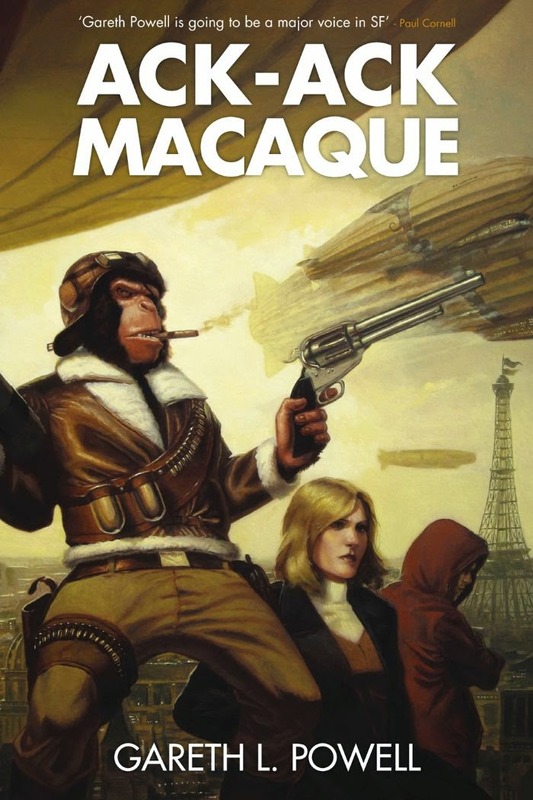 ‘Ack-Ack Macaque’ became my second short story sale to Interzone, the long-running British SF&F magazine. It appeared in issue #212 in September 2007, and Warren Ellis memorably described it as “the commercialisation of a web animation into some diseased Max Headroom as metaphor for the wreckage of a fucked-up relationship.” The story garnered some good reviews and went on to be voted the year’s favourite short story in the annual Interzone reader’s poll. That’s where it should have ended; but monsters, once summoned, can be hard to dismiss. In 2012, I set out to write a murder mystery set on a giant Zeppelin. I wanted to explore different notions of what it means to be human, so the characters included a woman who had half her brain rebuilt with artificial processors following an accident; the self-aware recording of her dead husband; and a man who finds out he’s a clone. They had all considered themselves human in the past, but now weren’t so sure. All I lacked was the viewpoint of a character that had never been human at all, but had been ‘uplifted’ to consciousness. Ack-Ack was waiting for me, smoking a cigar in the dark recesses of my imagination. “About time, too,” he said. 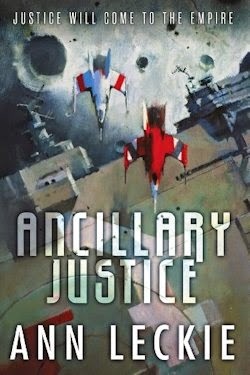 The novel, Ack-Ack Macaque, appeared from Solaris Books in January 2013 and went on to co-win (alongside Ann Leckie’s all-conquering Ancillary Justice) the BSFA Award for Best Novel. Writing the main characters—who are all outsiders, alienated from the rest of humanity by the surgery that’s made them different—was a fascinating and challenging experience. To convincingly portray them as individuals, I had to try to put myself in their position. I had to imagine what it would be like to be a creature with the mind of a man and all the attitude and bad habits of a monkey, or a former journalist whose thoughts now ran on mostly artificial neurons. Luckily, I guess we all know what it feels like to be an outsider. We’ve all been in situations where everybody else seems to know what’s going on, and we’re left floundering; where something about us—our clothes, the music we like, our sexuality—sets us apart from the crowd; and I was able to draw on those feelings of insecurity and self-consciousness to bring the characters’ inner thoughts to life. Meanwhile, Ack-Ack had been busily spilling out into other media. To help launch the book, a five-page Ack-Ack Macaque prequel strip appeared in the December 2012 issue of the legendary British comic 2000 AD. I also set up a Twitter feed in the monkey’s name, and he started interacting with his readers, quickly gathering an army of loyal followers who bombarded him with funny monkey pictures, banana jokes, and marriage proposals! The sequel, Hive Monkey, appeared in January 2014. At the time, it was the first novel-length sequel I’d attempted, and to start with, I wasn’t sure I’d be able to pull it off. What if it wasn’t as good as the first one? I needn’t have worried. Climbing back about the skyliner Tereshkova felt like coming home. I’m extremely fond of all the main characters, especially Ack-Ack and Victoria Valois, and found it immense fun to hang out with them a second time, even as I broadened the alternate universe setting to ask new questions about the nature of humanity and what it is that makes us unique. Hive Monkey was my first sequel, and Macaque Attack marked the completion of my first trilogy. I won’t say how or why, but Macaque Attack features appearances by characters from my 2011 Solaris novel, The Recollection [reviewed right here on TSS—Ed] which means this ‘trilogy’ is actually more of a ‘quartet,’ and the monkey’s adventures have been playing out against a background far more epic than he could possibly have suspected. As well as examining questions about the nature of memory and what it means to be human, these four books also concern themselves with notions of friendship, family and belonging. Ack-Ack Macaque starts out alone and gradually accretes a kind of ersatz family group or, as he thinks of it, a troop. The cynical, embittered veteran finds himself beginning to care about those around him. He takes on adult responsibilities and, as a consequence, he grows up. At the end of book three, he is wiser and more human than he was at the opening of book one. As, I hope, am I. Writing these books has been a hell of a lot of fun, and I’ve learned a lot from the process. I’ve had a blast, but all good things must eventually come to an end. I’ve said what I wanted to say, and now it’s time to say goodbye. I will miss Ack-Ack and Victoria terribly, but their stories have been told and I know it’s now time to move on to other projects. Ack-Ack Macaque may have left the building, but, if the stars align just right and the wind’s blowing in a favorable direction, then one day it’s just possible he might come back. 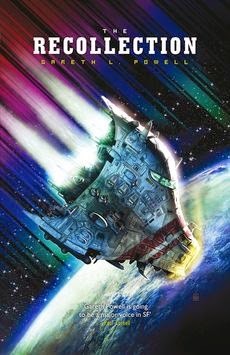 Gareth L. Powell is an award-winning science fiction and fantasy author from Bristol whose books have been published in the UK, the USA, Germany and Japan. You can find him online at www.garethlpowell.com, and follow him on Twitter at @garethlpowell. Should you be brave enough, the aforementioned monkey tweets too, as @AckAckMacaque.